In my last article Do Animals Need Healing? Yes, Indeed! We discussed the emerging concept of Animal Healing and why is it sometimes important to heal pets. This article throws light on the Pets from Energy beings point of view and Energy System of pets. So, do animals also have Aura & Chakras? Yes, they do have. Don't be surprised as this is what we are going to discuss in this article. It is necessary that as we keep ourselves protected and healed, we keep our pets also healthy and protected energetically apart from the medical care they need. So, for those who have lazy pets or aggressive ones or may be pets prone to health issues or have behavioral issues, they can seek help from Energy Healing Methods or Alternative Healing methods also for their pets apart from regular Veterinary help they seek as no matter how many tests they get done for the pets, reports would keep showing normal but still if there is no change in your pet’s mood or behavior then you need to seek answers for the same. It may be possible, your pet is trying to communicate something to you or maybe you both aren’t able to understand and synchronize with the commands or language or words used to communicate with each other. When a puppy or kitten comes home, it’s all together a different experience for them. They are babies (separated from their mothers after birth) and they are trying to relate and connect with this world through us. Their very first experience is with us, in our home, they seek us as parents or guardians and our home as their own home. 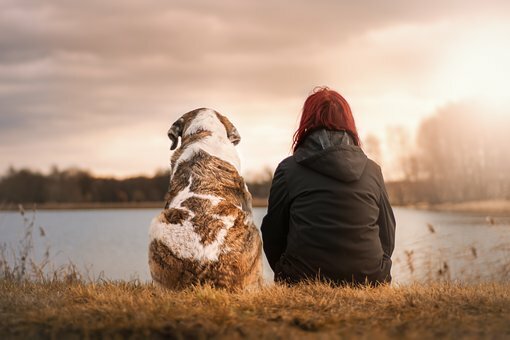 So, when you are planning to keep a pet, make sure you know you are ready for this responsibility as this is not fun, it is a cosmic connection and healing for both the owner and the pet sent by the universe due to need of support may be emotional, mental or karmic or soul level support. The reasons can be enormous as when working with pets on deeper or soul level we can even get to know these things. It’s been 18 years of experience with different breeds I personally had taken care of and the most notorious one is now with us so altogether 19 and a half years of experience of dealing with babies who can only express and not speak and remains a baby all life!!! Sometimes your pet’s behavior and their habits are strongly inspired by the breed they belong to so be careful with which breed you are choosing for your family. Also, it is recommended to get your pet trained within 6 months of their birth and adoption as this is when their mind and consciousness is in the process of development so what they observe and learn in this age group, it will be followed by them for lifelong. The trainable age of however, few breeds could range from 6 months to 2 years like Labradors. Few pets come with inherited habits and training like Labradors so all you need is patience and determination to help them learn, get trained and habitual to follow your commands. For dogs like Labradors and few others they have to go through formal dog training as they sometimes are mischievous and greedy too. But smaller breeds like Pomeranian or Pugs or Spitz, Lhasa apso etc. self-training by owner can also be enough in which you can set their walk and pee time, help them understand about good and bad habits by keywords or specific expressions as they are more of a family dog breed and they don’t require much of formal trainings. Healing animals is easier and as they are more receptive and non-judgmental unlike human nature, healing works great with them. 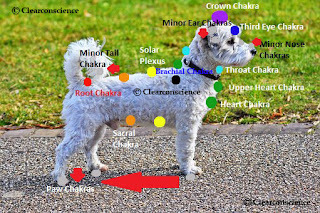 The 8th Chakra which animals have is called the Brachial Chakra which the center point (Major Chakra) of animal-human communication and helps your pet recharge its energy. It is a vital chakra located between the shoulders (on the back) and the one from which the healing must be started. This chakra is vital because it is the center point connection for all other chakras in the animal body. When the Brachial Chakra is blocked or imbalanced, the pet might show signs or behavior patterns like not wanting to be touched or refusing connections with humans and bonding issues with the owner and others around. 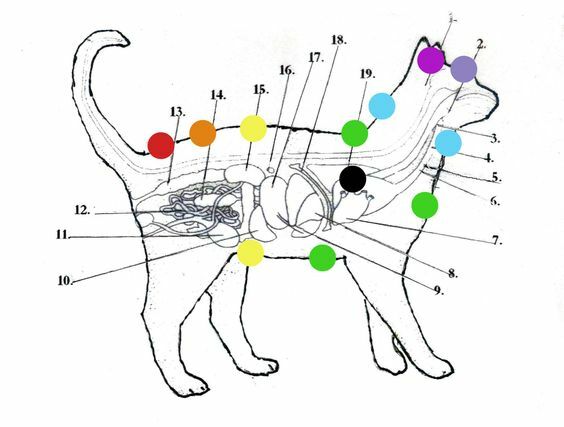 Cats also have 8 Major Chakras and rest minor chakras under ear flaps, paws, at the tail. 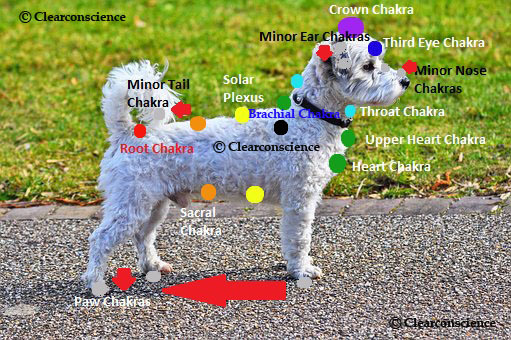 Same way, other animals have the same chakra classifications and can be healed on these energy centers. Reluctance to touch (other medical reasons: Arthritis, Inflamed skin, etc. ), Refusal to connect or bond. So, the above chart depicts the behavioral patterns your pet may be showing and now you can easily figure out the causes for the same. So, before concluding this article let us not forget that use of alternative therapies and healings is not a replacement to medical treatments but it is an additional help that can surely assist in maintaining your pet’s optimum health physically, mentally, emotionally and Ethereally on spiritual ascension level too as they also have to clear their karma in some form. There are, however, different ways to heal your pet such as Usui/Animal Reiki, Lama Fera (I have personally used for my own pet), Angel Healing, Crystal Therapies, Bach Flower Remedies, and Sound Healing etc. But what matters is intention and faith along with patience as animals responds quickly but in chronic cases it may take time to show positive changes on a higher scale but this does not mean healing isn’t working, it always work but depends on the case and the level of energies and blockages that are getting diluted and released. Hope, this article will help pet lovers and owners as a source of important information for their animal companions. Love, Light, Peace, Gratitude and Blessings to all (including our pets)!